(New Home, New Building, Major Exterior Changes includes any project with 501 or more additional gross sq. ft., etc..) Application fee includes 2 Schematic reviews, 2 Preliminary reviews, 1 Contract Documents review, 1 Pre‐Construction site visit, 3 Construction Period reviews by the inspector and 1 Project Completion review. 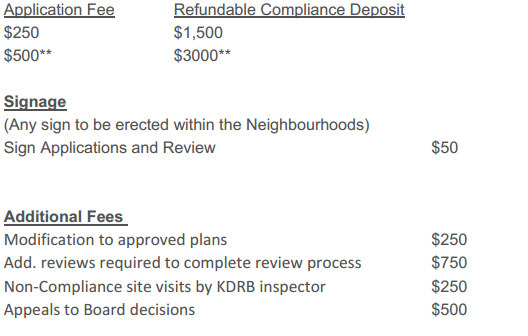 Additional KDRB meetings are $750.00 each and additional inspector site visits are $250.00 per visit. (Reroofs, Gutters, Hot Tubs, Minor Landscape Changes, Simple Exterior Change without additional gross sq. ft. **Simple Exterior Change with additional gross sq. ft. from 0 to 500, etc…) Application fees includes 2 KDRB review meetings and 2 Inspectors site visits Additional review meetings at $750.00 per meeting and additional inspections at $250 per inspection.